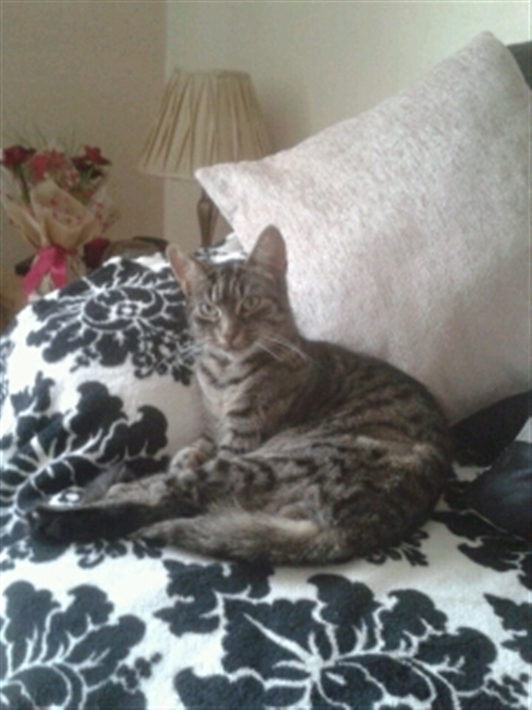 homed just a few weeks later during which time she was spayed, microchipped and had her first vaccinations. New owners, Michele and Julie wanted to get Poppy home and settled as soon as possible and were happy to take Poppy back to the vets for her second vaccination. We soon had a lovely update that "Well we are truly in love with our little Poppy. She didn't cry on the journey home, she's been very inquisitive up on top of cupboards etc as to be expected! She didn't know what to make of Splodge (the already resident cat) both hissed at each other and had a set too, but since have kept their distance, but all will be ok."
One week into her new home and new life we heard that "Poppy has settled nicely, she's so loving and enjoys lots of cuddles, very purry and a huge miaow! She loves sitting on the window ledge and watching all the birds and also loves all the space to run around like crazy." It is always fabulous for fosterers to hear how their former charge is getting along. We become attached to our foster cats who are all special and we just want them to be happy and loved, just as Poppy very clearly is.